Yes, that's a cake. Wait, where are you going? Megan offered some excellent ideas for a theme Halloween party yesterday. Now allow me to expand on your menu options with suggestions to delight and horrify your party guests. 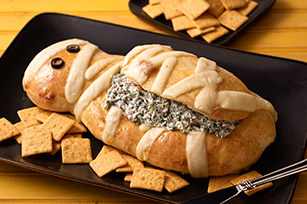 The Kraft website has a host of recipes for savory, spooky party foods. 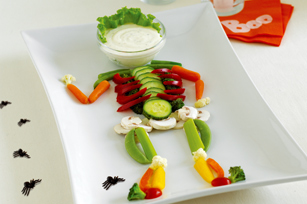 This skeleton vegetable dip is a healthy party option. Just keep a supply of veggies on hand to rebuild your skeleton as he gets depleted. The yummy mummy spinach dip is made with pizza dough and melted cheese. And you could swap out that filling with just about any sturdy dip, either store bought or homemade. 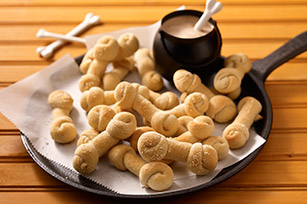 These cheesy bones are knotted refrigerated breadsticks rolled in parmesan cheese. Again, you could use your choice of dipping sauces if you don't like the spicy ranch sauce the recipe provides. For the sweet portion of your party, the Better Homes and Gardens website has a huge creepy cupcake section. 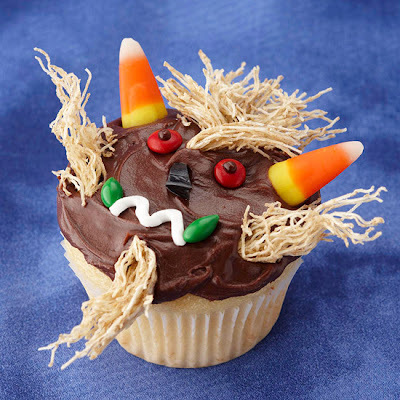 My favorites are the cauldron cupcakes and howling werewolf cupcakes, and there are many more cute and creepy confections to explore there. 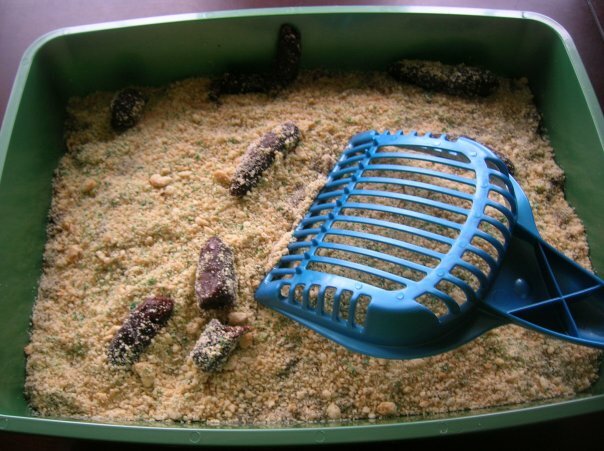 Finally, the coup de gross of any good Halloween party: kitty litter cake. I made this, and I promise you, it's edible. Really. When cakes are cooled to room temperature, crumble them into a large bowl. Toss with 1/2 of the remaining cookie crumbs, and the chilled pudding. You probably won't need all of the pudding, you want the cake to be just moist, not soggy. Watch your texture carefully. 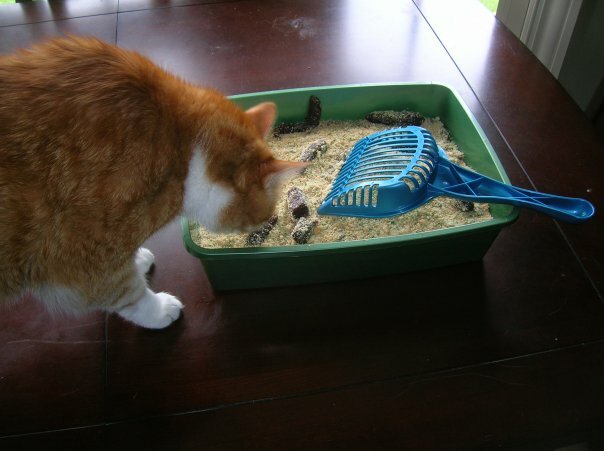 Put cake mixture into the litter box. Bury the brownies randomly in the cake and sprinkle with half of the remaining cookie crumbs. Sprinkle a small amount of the green colored cookie crumbs lightly over the top. Be as artsy as you like with the brownie distribution. 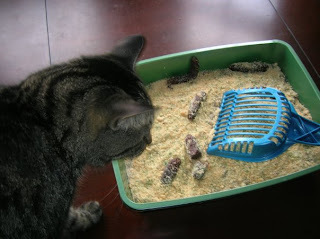 Be sure to hang one over side of the litter box and sprinkle with a few green cookie crumbs for extra disgusting authenticity. 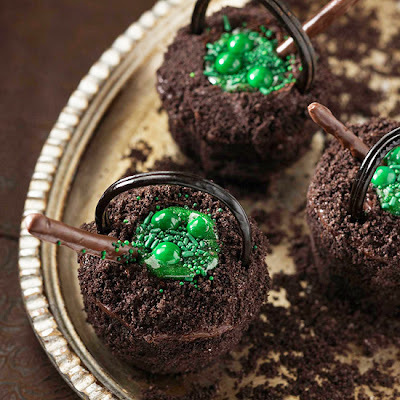 Serve with the litter scoop for a gross Halloween dessert. Frankie had nothing to do with the contents of this box. His presence in the photo is for comedic purposes only. I adapted this recipe from AllRecipes.com for a cake auction a few years ago. At the auction, my offering was met with stunned silence before eventually being claimed for $25. It's actually quite yummy ... you just might need to eat it with your eyes shut. So what are you serving as your Halloween get-together this year? I WANT TO MAKE THOSE BREADSTICKS! Those look so cute. I've wanted to make Martha Stewart's meringue bones but it always seemed like so much work. These look easy, yummy and adorable. BTW, Sara, when my dad saw the cake, he grinned from ear to ear and said the poop looked great, very realistic. Hooray! I turned into a poop artist while making them. "Not gross enough! Keep trying!" And yes, those breadsticks need to be in my tummy NOW.